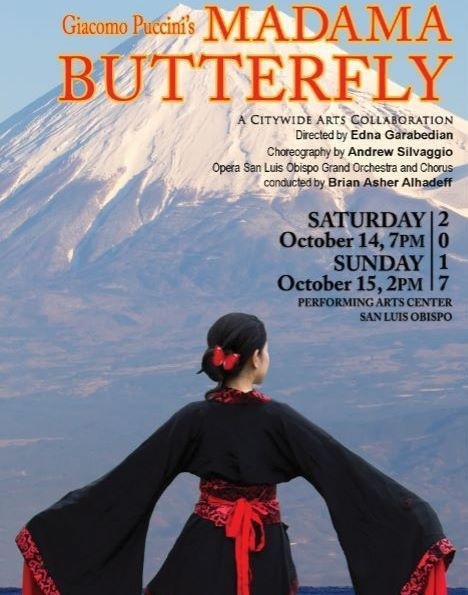 We recently attended Opera San Luis’ performance of “Madama Butterfly” and were enjoying it until the final scene. That’s when we were stunned — appalled, really — to see the grief-stricken character Cio-Cio San grab the American flag off its pole (stage right), throw it onto the floor, then drag it as she sang. There were audible gasps in the audience, indicating there were many others among us deeply offended by such abuse of our flag, which is never to touch the ground. Worse, it shows Opera San Luis’ willingness to exploit and demean the tragedy of Cio-Cio San to make a gratuitous and contemporary political statement. In the future, instead of financially supporting this opera group, we will direct donations to the Wounded Warrior Project. There’s a reply from the company’s artistic director here. But that is the story. Boycott Madame Butterfly then. These nationalistic brainwashed idiots, it gets so annoying. It’s just a piece of colored cloth in the end of all really important things and matters. “Worse, it shows Opera San Luis’ willingness to exploit and demean the tragedy of Cio-Cio San to make a gratuitous and contemporary political statement.” And yet the opera as an performative entity isn’t the comercial exploitation of both Japanese culture and the best example of Puccini’s bizarre obsession with fetishizing the mental breakdown of women? And these people still care more about a coloured piece of fabric. Ridiculous. Yep, that’s what most operagoers are thinking. Ah, the world of academia! So good at deconstructing. So bad at writing. Ah, the world of internet commentators! So good at negativity. So bad at critical engagement. I have a suspicion that this leitmotiv of yours stems from continuing resentment re your GPA dropping below 2.0. Do tell us how you know that ‘ANON’ is an academic. And that the ‘an’, as also the ‘m’ missing from ‘commercial’, is not a typo. Also, as you are such a whiz at grammar and proofreading, how came it to be that you overlooked that missing ‘m’? Please don’t try telling us you stopped at the ‘an’ in sheer disgust. Apparently, America needs to endure its own homegrown brand of fascist totalitarian nationalism in order to really understand what it means when respect for the flag turns into the cult of the flag. They might indeed learn from German experience: the terrible cult of the Reichsflag, and, after 1945, the cult of the flag in communist East Germany (both not in unsignificant part in lies, which, according to Joseph Goebbels, will firmly establush themselves in peoples’ minds when repested often enough). As the German poet Rainer Kunze said: “Mein Freund, des Fahnenhissens bin ich müde” – “My friend, the hoisting of the flag has tired me.” Obviously, the protesting couple, blinded by unreflected nationalism, has lost, or, worse, knowingly refuses (thereby conciously or unconsciously condoning the protofascist tendencies affecting the republic and the nation of America to an ever serious and dangerous degree) to intellectually engage with any form and expression of art. Sadly, their behavior bodes ill for the cultural and intellectual health of the democracy they claim to uphold, and which, by their very action, destroy. I hope they will overcome their misguided narrowmindedness, and give generously to both the wounded soldiers and the opera company. Edgar, et al: For the record, my wife Elise Cassel and I aren’t fascist totalitarian nationalists so blinded by unreflective protofascist tendencies as to be unable to engage with art. We are in fact grownups of sound mind and body unafraid to object when art becomes mere cant. We’re also pretty sure that our behavior in doing so poses no threat to representative democracy. In fact, we see our behavior as civil, civic discourse — an essential duty of the citizen of a representative democracy — and we offer to engage with you or anyone in such discourse on one condition: Don’t start the conversation off by calling us names. The statement made is neither contemporary nor gratuitous, but fitting Butterfly’s experience of her uniformed U.S. husband. What it does not fit is her character or Japanese behavior. These sorts of things coming out of the U.S. only confirm just how naive, uncultured, childish and totalitarian such a large segment of their society has become. Just look at their “President”, who is but a symptom of the underlying decay of their nation. On a recent visit to their “Land of the Free”, I was told in a very matter of fact way by a fellow concert goer that we in Europe aren’t free. I asked why and was told that because we don’t have the right to carry a gun we are not a free society, as we place our security in the hands of others. Nodding approvals to this ridiculous statement came from both sides and in front of the man telling me this. Concerning this “scandal” about the flag in Madame Butterfly, I think that this segment of the U.S. populace has more in common with North Korea than they do with the free world and the entire country seems to be rapidly moving in such a direction. A truly scary place! +1. Couldn’t have said it better myself. In case you were not aware, Mr. Trump lost the popular vote by 3 million votes. There is a rather large segment of the country, as in more than half of it, which despises him and everything he stands for. As for guns, that same half of the country would like far more restrictions on gun use. As for the other half, it goes without saying that we in the US have major issues to deal with. But please, continue to generalize about 300 million people in order to feel better about whatever issues you have. As a New Yorker, I’m one of Trump’s hometown 90% of citizens who didn’t vote for him. That said, your response overlooks the fact that Merryweather mentions a SEGMENT of our population twice. Popular vote, which as you knows counts indirectly, is skewed by the fact that at least 30 of our 50 states are foregone conclusions for one party or the other, and the general election for President is decided only in 12 to 18 “swing” states. Republicans in California, Illinois, New York, and other “blue” (foregone conclusion for Hillary) states vote in the primaries but don’t bother in the general. If the Republican share of registered voters in those states is 30-40% and stay-at-homes are one person in five, you have 6 to 7 million “missing” Trump votes in the general in just those three big-population, non-swing states. The same is true on the “red” side, and there are more of those states, costing Hillary, but their populations are smaller. Not the first time this has happened. In 2010 Lee Blakeley directed a beautiful Butterfly at Santa Fe Opera. In the final scene he had Cio-cio-san take the American flag from the wall and with it she covered her child so he would not have to witness her suicide. It was a beautiful image. At the dress rehearsal 2 patrons (who obviously were major donors) complained to the general director Charles MacKay that it was a disgrace that their national flag touched the ground, and they demanded the scene to be changed. MacKay gave in and ordered Blakeley to change the scene. Blakeley was not pleased by MacKay’s lack of backbone. Bravo Brian Asher Alhadeff for trying to educate your audience. It seems that these people do not wish to see on stage anything which they would not wish to see in reality (or, what happens on stage is, to them, a part of reality). They seem to be unable to distinguish between a representation of a thing and the thing itself. One cannot resist the conclusion that they believe that the flag—not only the idea of the flag, but any instantiation of the flag—possesses some inherent quality of sanctity (or something close to sanctity) which is violated whenever any representation of the flag is brought into contact with the ground no matter what the circumstances. It seems similar to the manner in which Catholics and members of the various Eastern Christian Churches regard the consecrated bread and wine (i.e. as being in a real sense a physical manifestation of God). However, there is in fact no sound reason for a Catholic or Eastern Christian to object to a theatrical representation of an abuse of the Sacrament using unconsecrated bread and wine (i.e. nothing more than wheat and grapes), such as, for example, may be said to take place in Tosca. It is indeed a curious state of affairs when a simple piece of printed cloth is held to possess such metaphysical and transcendent qualities that a kind of profanation occurs when it is allowed to touch the stage of an opera house. It’s utterly dismaying that someone could sit through Madame Butterfly and be outraged by, nope, not the injustice and tragedy portrayed, but by the flag touching the floor – that someone could be more offended by a (mis)perceived “disrespecting” of the flag than by the human cruelty and the all-too-real human cost of imperialism as depicted in this opera. When flags and nationalist paraphernalia take precedence over human lives, something has gone seriously wrong. These people, shall we say, completely missed the point. The artistic director’s response is spot on – and very gracious. Dear Butterfly would have burnt it if the local fire department is competent and has enough government funding. Another reflection of our time. I was there and I too was shocked, shocked, shocked that my pleasant evening of watching a 20+ year old man — and eventual bigamist dead-beat dad — impregnating a 15 year old girl, and then kidnapping the child from his mother’s corpse, was ruined by the horrors of seeing the American flag touching the floor. Regardless of how I may or may not feel in terms of the objectors to this particular performance (or towards the performance itself), it is difficult for me to imagine a classier and more civilized response than the one that the artistic director answered them with. In Yoshi Oida’s staging at Tokyo (2017),Cio-Cio-San behaves as the same. The US “flag code” has numerous provisions which are routinely violated without creating a public crisis. Did you know you can’t carry the flag horizontally? Can’t use it in advertising? The sports world’s trend toward big productions often overwhelms out the nobility and solemnity of the anthem. For example, the code also says that the flag “should never be carried flat or horizontally.” The code does not specify if it is appropriate for a flag 100 yards long to be held parallel to the ground, or shaken by the people holding it when the anthem gets to lyric “that star-spangled banner yet wave,” and then wadded up hastily to make way for a game about to start. It’s a piece of cloth. That’s all. Not if you’re fetishizing the object. Once upon a time I put down my headphones on the coffee table. It happened there was a book on the coffee table, and because I wasn’t worried about it, I put my headphones down on the book. It turned out that the book was by Nietzsche, and my friend, whose book it was, was very offended and thought I should apologize — not to him, but to Nietzsche. He was serious.